Children are surprised as they open the gate at the edge of the parking lot and peer down into the woods from the top of the small hill. 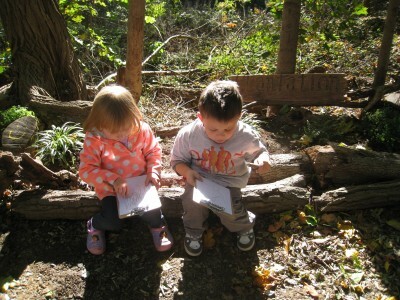 They enter our outdoor classroom by taking the steps or sliding down into the clearing in the woods. The cleared space is surrounded by a wood and bamboo fence with strategic openings to peer into the wild woodland, catching glimpses of squirrels, blue-jays, woodpeckers and even a possible deer. Pavers, created by each family, lead children to nine different locations named with simple action words, suggesting what may happen in each activity area. The “Move” area includes a mixing bowl xylophone, maracas and dancing scarves. 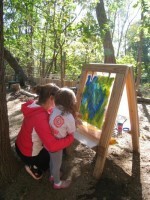 Nearby the “Create” area has a chalkboard, easel and weaving wall. 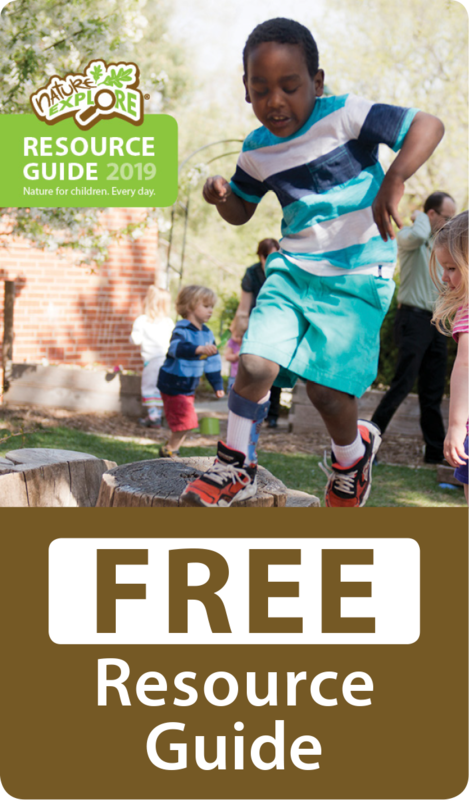 The “Cook” area is the popular corner kitchen where children make soup on the range, sweep the floor, talk on the telephone tube while relaxing on the Adirondack chair or share a meal of mud pies, acorns, and pebbles at the tree stump table and chairs. Outside the kitchen door are large pots of mint varieties for children to use in their recipes. Next is the “Perform” area complete with elevated stage and curtains for children to showcase their dramatic or musical talents. Adjacent to the stage are two “Build” areas, one where children can work with a variety of small manipulatives on tiled tables or the larger, messy materials area, where bins of loose parts are used to create larger structures. The other end of the talking tube is also located in this area. Both the Build areas encourage creativity and cooperation with open ended materials such as large and small tree cookies, pine cones, acorns, and a variety of wood logs and bamboo. Another popular spot is the “Dig” area, a driftwood framed corner full of soil to dig, rake and haul. 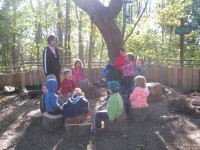 Under the wind chimes, children can “Gather” in the stump circle to listen to stories, sing songs and chat. These low stumps also double as a place for balance and stepping. The “Balance” area has two embedded pieces of driftwood salvaged from the nearby Susquehanna River. 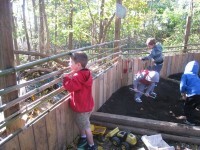 As children circle back towards the slide, they come to the “Garden” a log lined bed of native woodland plantings. 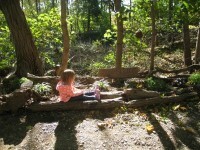 With dappled sunlight casting shadows throughout this space, children gravitate here to rest and wonder. 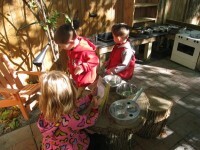 Most of our outdoor classroom was created with repurposed or natural materials found in our region. Bamboo was cut from a local property, signs were made from salvaged roofing slate and soapstone for the kitchen counters was taken from a school’s science room before it was demolished. To keep maintenance to a minimum, native woodland plantings, suitable for dry shade, were used in the raised bed and large pots. The entire classroom provides enchantment each season of the year. It is a cool respite in the humid heat of a summer’s day, a place to observe and investigate the decomposition of leaves and bark in the autumn, a most magical spot to see small periwinkle wildflowers and budding trees in the spring and a quiet, white wonderland in the winter. As children, staff and families spend time in our outdoor classroom, we anticipate new features and materials will be added to reflect the community in which we live. Our hope is that through this evolution the commitment to value creative exploration, cooperative problem solving and a genuine reverence for our natural world will strengthen our HFCDC community.